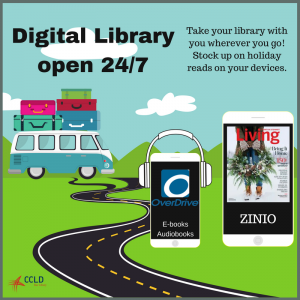 CCLD libraries will be closed Thursday, NOV 23 in observance of the holiday, but our eLibrary is always open — 24/7/365. For those of you hitting the road, libraries will be open until regular closing hours on Wednesday night, so come on in to load up on stuff to read, listen to, and watch on your long drive. If your preferred format is a smartphone, tablet, or other device, hit up our eLibrary for downloads or streaming content while on the road. You’ll need a library card to access, so come on in to the library branch closest to you to get one now. While all other CCLD branches will also be closed on Friday November 24, the Steele Memorial Library in Elmira will be open from 9am-5pm. Zinio | popular magazines galore like People, Rolling Stone, The New Yorker, etc. This entry was posted in Beneficial Bits n' Bytes, Community, Technology by Maggie Young. Bookmark the permalink.